Manchester based Big Lou Jones, is a well known face on the comedy scene who has a commanding stage presence matched by his punchlines and timing of their delivery. 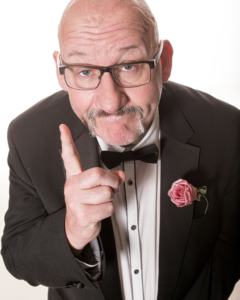 Big Lou has played most of the premier comedy venues in the North West and beyond. “Big Lou took the time to understand what we wanted, it was important to him to look and act in the right way to a room full of business people. He reacted well to a new idea we had on the day, our audience loved him and ultimately, which was the whole point of his presence, was very very funny” – Paul Walsh, Vice Captain, Greater Manchester Chamber of Commerce Golf Society.